Ever﻿y year our summer is jammed-packed & full of things to do. This summer might not turn out to be any different, although I would love to carve out some free time to just hang out, relax & knock some items off my summer bucket list! We're headed to Chicago for a week in July & my number #1 item is to ride the Ferris Wheel at Navy Pier. I'm sure it's super touristy, but I don't care :) Other than that, I'm hoping our summer is filled with backyard BBQ's, a few camping trips, a few river floats, bike riding, hiking, dining al fresco & everything else that summer should be! 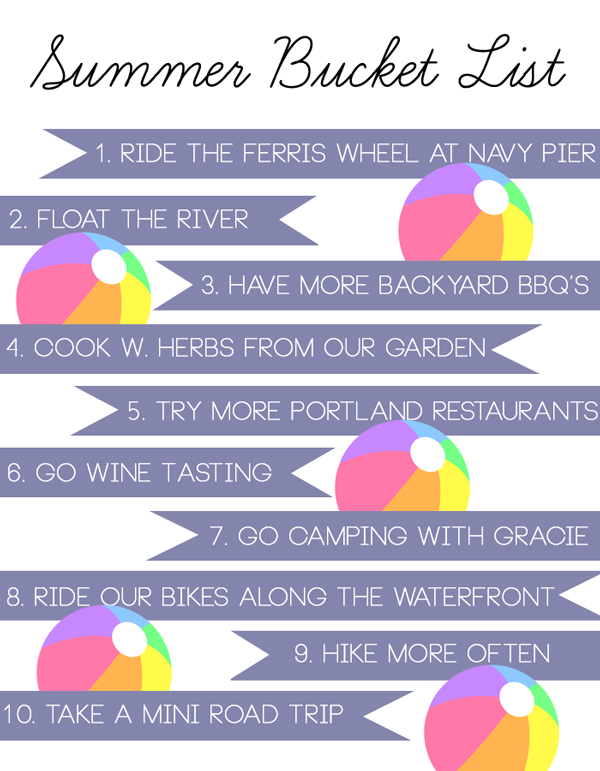 I love summer bucket lists:) I want to do one....it doesn't feel like summer yet to me! I will be helping you out with the 7, 8, & 10!! Great list! I need to put my summer bucket list in writing too. Lots of backyard BBQ's will also be on my list-- they're the best part of summer! As far as #6 goes, come out to Erath! I'll hook you guys up! What a great list. Growing herbs is on mine, so we'll see how that goes! Great summer list! I need to do that too, thanks for the reminder :) Can I ask what you use to make cute text/graphics like this? I love it!